Submitted photo McDonald’s had dozens of children at the event to meet superheroes, get their faces painted, receive gifts, and play games. Submitted photo Local children had many crafts, games, and prizes inside the store during the event. Pictured, many children color in the Hope Fund icon, Buddy the Backpack. 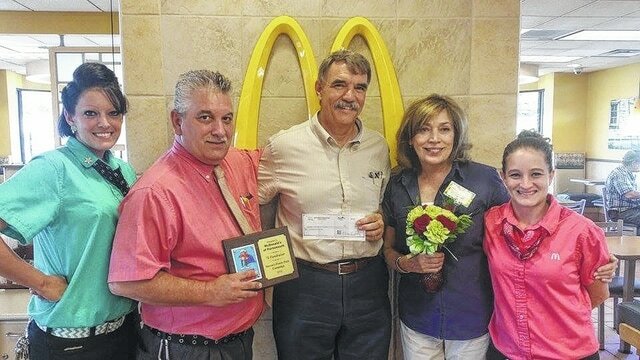 Submitted Photo As a token of appreciation for a successful event, a plaque was presented to Portsmouth McDonald’s. Earlier this month, a super hero themed event was held at the Portsmouth McDonald’s, to raise funds for the Steven A. Hunter Hope Fund. Proceeds from the event will go to the funds Power Pack Program, which provides weekend meals to area children. Mark Hunter, with the Steven A. Hunter Hope Fund said the event was a success and the proceeds will go a long way to feed hungry children. During the event, managers and crew of McDonald’s dressed up as superheroes. The event also included a DJ, dance party, photo booth, prizes, costumed superheroes and games. Local teachers from many schools, such as New Boston, Valley, Northwest , and more, were also present, volunteering and working the registers to earn profit for feeding the children in the area. “We’re humbled and pleased with the results and that they allowed us to participate,” Hunter said. Hunter said the $2,880 in funds raised will go a long way. “We raised enough to purchase 960 power packs, or about 3,840 meals, for hungry local kids,” Hunter said. Hunter said plans are underway for a similar event to be held in 2016. Hunter also gave credit to some of the event’s success to Daily Times staff writer and Steven A. Hunter Hope Fund volunteer Joseph Pratt. According to information from the Hope Fund, almost 1 in 3 children of Scioto County is considered food insecure. Through the Seven’s Power Pack Club, 750 children are helped every weekend in 11 public elementary school in Scioto County and two elementary schools in Pike County. For more information about the Steven Hunter Hope Fund, or to pledge a sponsorship, visit www.stevenshopefund.org.